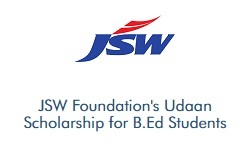 This scholarship program is designed for students pursuing full time 2 year course in B.Ed. Institute should be NAAC Accredited and NCTE Approved. This scheme is not applicable to JSW employees and their children. 1) Who should apply ? Student who are pursuing B.Ed course for the academic year 2018-19.